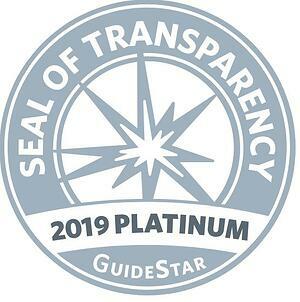 The Armed Services YMCA is proud to announce that it received the 2019 Platinum Seal of Transparency from GuideStar! The Platinum Seal is the newest and highest level of recognition offered by GuideStar, the world's largest source of nonprofit information. GuideStar Platinum enables nonprofit organizations to share their progress and results in important new ways - moving beyond simplistic financial ratios and reflecting the changes that organizations are making in the world. "By reporting our metrics and sharing our profile through GuideStar, the Armed Services YMCA is able to show our stakeholders and donors that we're intentional about measurement and learning in order to maximize the impact that we're making in the lives of junior enlisted service members and their families," said Armed Services YMCA President, William French. "Each year, millions of people use GuideStar information to make decisions about nonprofits and the work they do. We're proud to be recognized for providing the highest level of transparency to our donors who invest in our mission to Strengthen Our Military Family." To reach the Platinum GuideStar level, ASYMCA added extensive information to its Nonprofit Profile on GuideStar including, in depth financial information, qualitative information about goals, strategies, and capabilities as well as quantitative information about results and progress toward its mission. Check out the ASYMCA GuideStar profile here. The Armed Services YMCA is a registered 501(c)3 nonprofit that serves active duty military members and their families. In 2018, we registered more than 250,000 participants and delivered more than 1.3 million points of services to junior enlisted Soldiers, Marines, Sailors, Airmen, Coast Guardsmen and family members at 200 service centers in 18 states. Whether providing respite child care for parents in need, summer camps for kids, or assisting with emergency needs, the Armed Services YMCA is a nonprofit with a mission: Strengthening Our Military Family. Visit our website to see how you can join us in supporting military families.